Spring is here! Time for chicks. Your local feed store should have chicks for sale. You can purchase pullets only, which will give you all females. Hens do not need a rooster to lay eggs. However, if you have a rooster, you can hatch your own spring chicks. We hatch each spring. We have a small, 7-egg incubator that we use. Our hatch rate is usually 100% with good eggs. I also supply our local 1st grade classroom with hatching eggs. They have a large styrofoam incubator that holds 35 eggs. The styrofoam incubator hatch rate is about 50-65%, simply because it’s more difficult to control temperature and humidity. Today I’m setting up the small incubator. I’m also delivering eggs to the school this week. The Brinsea mini has a rotating tray in the bottom that rotates the eggs. There is a water well in the center. I will fill half of the Center well with water and set the temperature, let everything normalize and come to temp before I add eggs. At first plug-in, temp was in the 60s. Definitely not ok. It has taken about 25 minutes for the temperature to come up to 99.5*F, Which is considered idea temp. There is an alarm the will sound if the temp get too low or too high. Anything over 102.5*F or below 98*F for an extended time can kill the chicks. The days will count down until day zero, when the chicks will hatch. 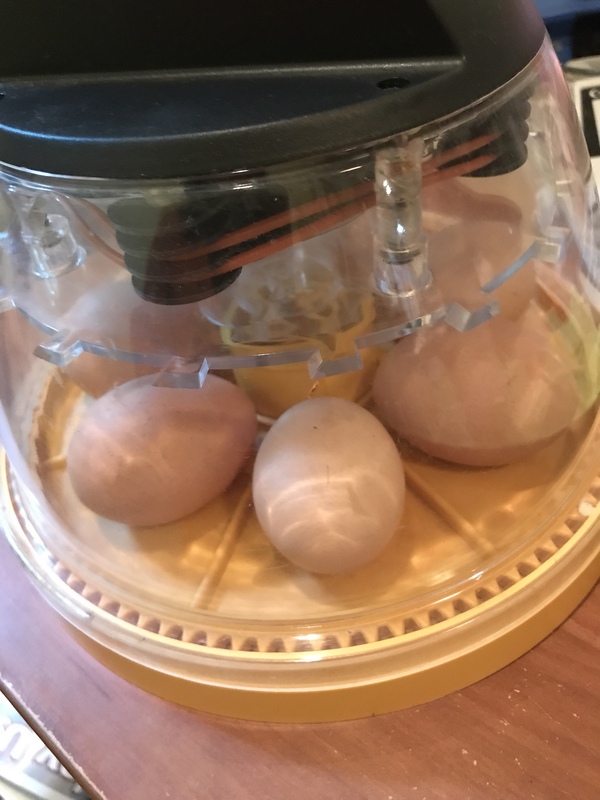 They can deviate from this, so I will remove the turning plate and fill up the water well completely two days before the eggs are scheduled to hatch. I’ve been saving eggs in the wine cooler to make sure the embryos don’t begin to develop early. I store them at 60*F.
You should only incubate clean eggs with a good shell. Never wash an egg you intend to hatch. There is a natural “bloom” on the egg that is anti-bacterial and provides protection to the developing chick. We will “candle” the eggs in a few days to see if they are truly developing. No need to incubate infertile eggs. Where is the information? Also just preparing for sept. Where r u teaching again online in August?